Blog » Easter Weekend Fun for all the Family! Easter Weekend Fun for all the Family! 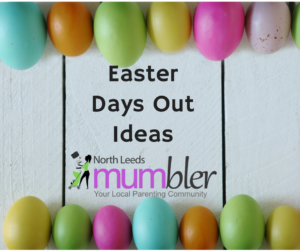 If you’re looking to stay local in North Leeds for the Easter Bank Holiday Weekend (19th -22nd April 2019) or you have family and friends visiting and are looking for activities to entertain the kids, there is so much going on locally including lots of Easter trails, egg hunts and parties! (To find out more about the below events including timings click on the link). Easter Crafts at The Arium (Fri-Sat), Enjoy free Easter crafts, such as Easter Wreath Kits, Colour-in Easter Egg Cups and Easter Colour-In Bookmarks. The outside play area, sandpit and café will also be open. (Free, drop-in event). Leeds Young Film Festival (Fri-Mon) The UK’s largest family film event where the whole family can watch, learn and play running until 22nd April at venues across Leeds. Easter weekend highlights include 360 Dome, the UK’s first VR Family Cinema, Animation Central and Screen Craft workshops featuring LEGO, Aardman, Disney and many more. Download the full timetable here. Good Friday Easter Boogie, Shake Rattle and Boogie (Fri) Come along to the Shake Rattle & Easter Special Event and the Old Kings Arms in Horsforth. A dance and music class for 0-5’s with an ‘Easter’ theme throughout (Pre-booking required). Easter Eggsplorers at Crag House Farm (Fri) Fun Easter activities for children from Decorating an Egg Hunt to Little Gardener’s Crafternoon. The outdoor play area and café will also be open. (Booking required). Easter at Harewood House (Fri-Mon) Meet the newest residents in the Bird Garden, explore the new Useful/Beautiful Exhibition in the House, enjoy family trails, spring crafts, treasure hunts and more. Abbey Inn Easter Egg Hunt, Bramley (Sat) Join the Abbey Inn from 2-4pm for their annual Easter Egg Hunt. Easter creative activities in the pub to start then outdoor Easter egg hunt. Easter at Farsley Working Men’s Club (Sat) This year at the Working Mens Club there will be an Easter egg hunt, Easter bonnet parade and disco! The Gruffalo and The Gruffalo’s Child by Julia Donaldson with the Orchestra of Opera North (Sat) Watch The Gruffalo and The Gruffalo’s Child with Opera North accompanying this double-bill. (Pre-booking required). Family Fun Day, Hall Park Cricket Club (Sun) Annual family fun day, FREE entry and lots of activities including giant slide, bouncy castle, zorb balls, bungee trampolines, climbing wall, children’s magician, face painting, live music, entertainments, food stalls, and much more! Rodley Nature Reserve Easter Egg Hunt, (Sun) Fun for all the family including a walk around the reserve to find hidden eggs, tombola, games, crafts, fairy and nature crafts. Thwaite Mills Fete (Sun), Join in a traditional Easter fete on Thwaite Island, with plenty of fun and games for all! Take part in the Easter egg trail and bonnet competition and there might even be a visit from the Easter bunny! Stables Pub Lawnswood Eggstreme Easter Family Fun Day (Sun) Family fun day including Easter egg hunt, bouncy castle, face painting, live music, photo booth with Ronnie the Rhino, food stalls and much more! For more ideas for days out click here.